Some of you may remember my post a while back about Muffin Monday -- I have been keeping up with my commitment to this weekly work "holiday," bringing in freshly-baked treats to the office nearly every Monday morning this past fall and winter. I've decided, however, that Muffin Monday needs to take a hiatus for the spring and summer; what better way to celebrate the "season finale" of Muffin Monday, than with Vegan Doughnut Muffins!? I clearly eat my fair share of dairy and eggs; why vegan doughnut muffins, you ask? Well, I recently learned one of my coworkers is vegan, and therefore, I have been harkening back to my vegan baking days so everyone can enjoy the treats I bring to share. Thanks to King Arthur Flour, (my new favorite go-to source for any new-to-me baking recipe,) I had a grand recipe with which to start. Veganizing these doughnut muffins seemed like a snap -- swap in some Ener-G for a couple of eggs, Earth Balance for butter, plant milk for whole milk, and ta-da! Vegan Doughnut Muffins for the masses! The recipe was relatively simple to prepare, used nearly all pantry staples, and is downright fabulous. 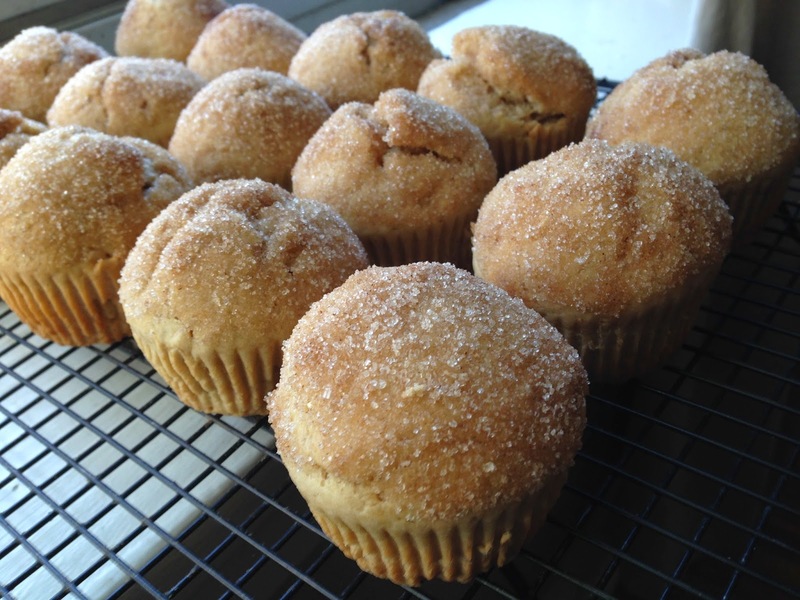 Moist, tender, subtly-spiced cakey muffins dunked in melted Earth Balance and cinnamon sugar ... I'm trying my darnedest to not eat the ENTIRE batch tonight! I can't WAIT to bring these to work to share tomorrow morning!! 1. Preheat oven to 425 degrees Fahrenheit. Place paper liners in muffin tins. 2. Combine the flour, baking powder, baking soda, salt, and spice in a medium bowl and whisk until well-combined. 3. Using an electric mixer, beat together the Earth Balance, oil, and sugars in a large bowl until creamed. Beat in the prepared Ener-G and vanilla until smooth. 4. Combine the milks in a glass measuring cup or small bowl. 5. Add 1/3 of the flour mixture to the Earth Balance mixture, beating until smooth, then add half the milk, half the remaining flour, the rest of the milk, then the rest of the flour, beating until smooth after each addition. 6. Scoop dough into prepared muffin tins. (I love using my #16 disher for this task!) Bake until muffins are domed and spring back when gently pressed, 16 to 18 minutes. (Muffins may not brown much ... that's ok.) Transfer the muffins to a wire rack to cool slightly. 7. Combine the remaining sugar and cinnamon in a small bowl. Brush the tops of each muffin with the melted Earth Balance while still warm, then roll the tops of the muffins in cinnamon-sugar. Enjoy the muffins while still warm, or cool completely before storing. Au revoir, Muffin Monday ... until the fall! NOM. These muffins sound wonderful! You have to love the simplicity of cinnamon and sugar. I made them today. Delicious! !